That achievement is made all the more extraordinary given that, at the age of 17, he lost the tips of two fingers on his right hand in a welding accident. I do believe in a God. I’m Catholic, but I’m not one who goes to church. The only time I went to church was when I joined the scouts, and that was because I had to. What is the biggest misconception about Tony Iommi, that you’re evil? Yes, I’ve heard that one a few times. Certainly when Sabbath first played in the USA people were frightened of us. They thought we’d turn them into a frog! It was very peculiar. They were frightened to death! Do you have anything in your wardrobe that isn’t black? I have, as a matter of fact. But not a lot. I have some white shirts, but I tend to wear them under a sweater – a black sweater. What are the best and worst drugs you’ve taken? For me the best was cocaine and the worst was acid. I hate being out of control. With cocaine I felt I was in control, I knew what was going on. But acid… I was in America in the early 70s and I had a terrible headache, and this girl said she had a couple of pills for it. And she gave me some acid. Bloody hell, I didn’t know what hit me! Thank God the rest of the band came and sat in my room and calmed me down. I was gonna jump out the window! Did the acid cure your headache, though? Oh yeah, I forgot all about the bloody headache! But I had one the day after. I would have liked to have not chopped the ends of my fingers off. It became a burden. Some people say it helped me invent the kind of music I play, but I don’t know whether it did. It’s just something I’ve had to learn to live with. It affects your playing style; you can’t feel the strings, and there are certain chords I can’t play. Right at the beginning I was told by doctors: “You won’t be playing guitar.” But I believed I could do it, and I did. In the mid-80s, after Ronnie had gone and we’d done the album with Ian Gillan [Born Again], I didn’t have any friends in the band any more. Geezer had gone, Ozzy, Bill, Ronnie. That was a low point, to start all over again. But I never thought about giving up. In hindsight, was it a mistake to have Ian Gillan in Black Sabbath? I don’t see it as a mistake. Originally it wasn’t going to be under the Black Sabbath banner; we talked about doing a supergroup. But we had some great times, and Ian is still one of my best friends. He’s coming to see me next week, and he’s staying over, so no doubt we’ll go out and get pissed! It’s great to get sloshed and talk about old times and new times. Cars. I used to collect them. I had three Lamborghinis, God knows how many Rolls-Royces. And, believe it or not, I once bought a pink Jag. Believing in what you do. I never took any notice of other people’s opinions. Something has always driven me. 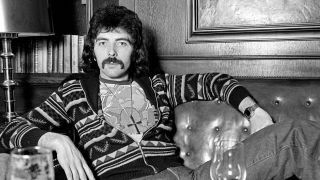 What can Tony Iommi do that nobody else can? I don’t think there’s anything. What about inventing heavy metal? Well, yes, I suppose I did that. Is Heaven And Hell Black Sabbath's Finest Hour? That’s a difficult one. I don’t know what the meaning of life is. The way the world is now, you just have to live the best you can and enjoy life. You won’t be saying that when you wake up after that night on the piss with Ian Gillan. I won’t be saying that then, no. But I’m saying it now! That’s the thing with him, I always wake up with a bloody hangover and he never gets one. Well, I don’t know, cos it won’t be me writing it. I shudder to think. But something nice, I hope.